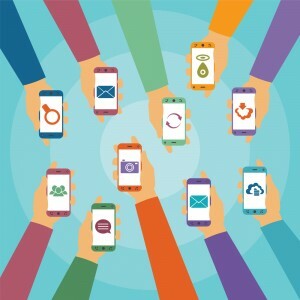 It’s no secret that sharing content is an excellent way to grow your online network. By sharing interesting articles, quotes, images or videos with your followers you are adding value to their day and boosting your credibility. But if everyone is trying to share content, how do you stand out from the crowd? The short answer to that question is you find unique content and share it before anyone else does. But traditionally, unique content is hard to find and discovering it takes up valuable time that most of us don’t have spare. Twitter is no doubt the neediest social network when it comes to sharing content. Tweeters expect a lot of fresh, regular content and you have to be the one to provide it for them. It’s not good enough to Tweet once a week, or sporadically five times an hour and then go missing for the rest of the day. 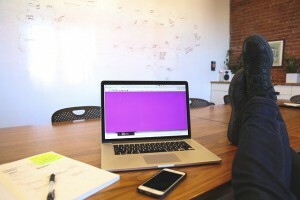 This is the universal challenge solved by scheduling tools such as Hootsuite and Buffer. But even with the scheduling help from these tools it is still time consuming finding content that is worth sharing with your network. There is a LOT of average content on the internet, and I certainly don’t want to attach my brand to that, as I’m sure you don’t either. What if you could find the type of content your audience loves, increase their engagement and at the same time get back your discretionary time? Add more value to your network and get back discretionary time. Sounds great to me! 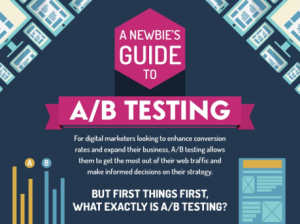 Let’s have a look at seven tools you can use to achieve exactly that. Feedly is a helpful app that allows you to create customized streams of online news sources and blogs. The great thing about Feedly is it makes it super easy to sift through your favourite blogs every day and share the ones that resonate with your audience. You can create an account online, or simply download the app on your tablet or smart phone. The real value of Feedly in my opinion comes from the smart phone and tablet versions of the app. (I’m an Apple user from way back, but I’m sure it works just fine on Android!) When you download the app, the first thing you should do is create feeds by segmenting your favourite blogs into topics. On the right you will see a screenshot of my iPhone where I have ‘Marketing’, ‘Business’ and ‘Leadership’ as my feeds. Once you have decided on some preliminary topics start to add in all the blogs and news sources you currently read on a daily basis. The app is very user-friendly when it comes to searching for blogs. To demonstrate I searched for ‘Bluewire’ in the screenshot below. 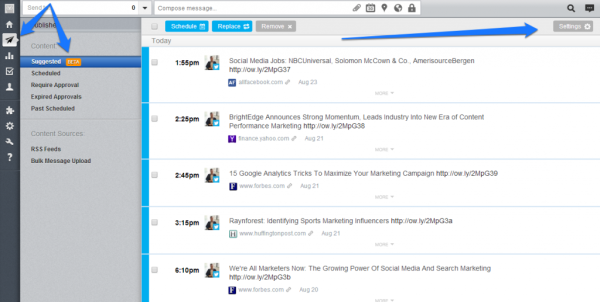 The little ‘+’ sign highlighted allows you to quickly add blogs into your different feeds with the click of a button! Make sure to segment these in the topics you just created to make the feeds useful. If you are drawing a blank on what blogs or sites to add into your feeds, the app will recommend a set of popular blogs under their own genres. After your feeds are set-up all the hard work is out of the way. Now you can filter through and discover great content every day from the convenience of your smart phone or tablet. 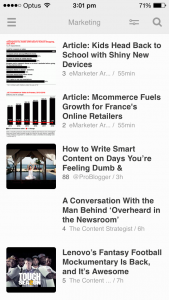 The Feedly interface is visually appealing, making the content easy to read and more engaging. Check out on the right an example of one page of my ‘Marketing’ feed. By flicking up and down on your device, you will be able to sift through loads of content in a fraction of the time it used to take you. If a headline draws you in, just click on it and the app will generate a preview of the article. In some cases it has the rights to show you the whole article. But don’t be concerned, if it doesn’t and you want to read further, the transition is smooth. I choose to e-mail myself a bunch of cool articles I find using my tablet every morning from bed, this kick starts my day. After my morning coffee and a bite to eat, I’ll have a second read of those articles from my internet browser and decide if they’re worth sharing or not. You will find what works best for you. All your favourite blogs in one spot, on a great looking interface and through the convenience of your smart phone. Thanks Feedly. 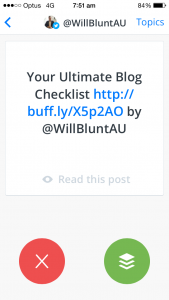 Buffer’s mission is to make sharing content easier for everyone. (Or something like that!) 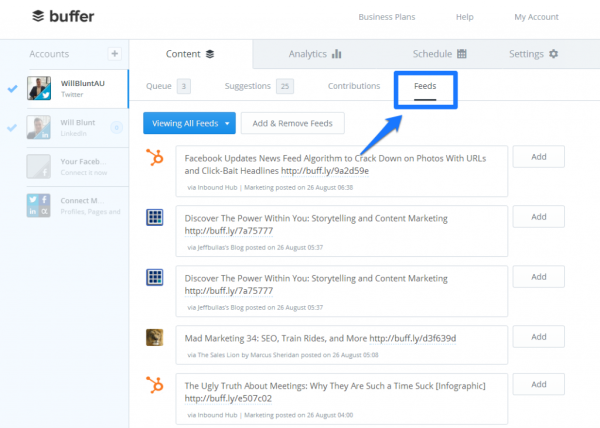 As a result of the innovations they have made to facilitate sharing content, Buffer has introduced some helpful ways to discover great content too. Feeds, Suggestions and Daily. Feeds by Buffer is only available to premium subscribers, and functions similarly to Feedly in the sense that you can add your favourite blogs and news sites into a personalized stream. 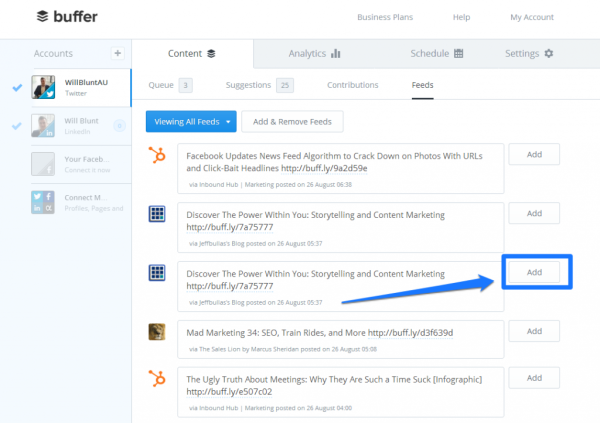 The key difference is that Buffer automatically suggests the headline and shortened link for you to share using the in-built scheduling tool. 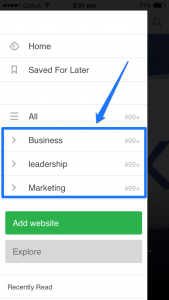 If you’ve signed up for Buffer ‘Awesome’ you will have access to the feeds tab which is highlighted below. In order to fill this with all of your favourite sources of content, simply click on the ‘Add + Remove Feeds’ button near the top of the screen. As you can see in the image I have added RSS feeds such as Jeff Bullas Blog, HubSpot Inbound Blog and The Sales Lion. You can have up to 15 different sources of content within this stream. You will also notice up the top left of the screenshot, that I am viewing feeds in this instance with my Twitter account, meaning that anything I decide to schedule or share will be sent straight to that account. If any of the headlines catch your eye, you can easily share them by clicking on the ‘Add’ button to the right of the link. It’s best to click on the link first, and read the article before sharing it with your network. But that is a choice you can make depending on how much time you have available. I would highly recommend personalizing the post you are about to share too. Buffer makes this very simple, all you have to do is click in the box on the left of the ‘Add’ button and you can add hashtags, commentary or anything you like to the quote. If you choose not to edit the headline the chances are hundreds, if not thousands of other people will share exactly the same thing as you. This eliminates your uniqueness, and will come across as lacking credibility. To give you a personal example, my post ‘Your Ultimate Blog Checklist’ was featured on the Buffer Suggestions tab almost a month ago (Which helped it get shared over 1200 times!). Until this day I am still getting Twitter notifications where users have shared that post with the exact same tagline, link and handle. See below. The Buffer Suggestions panel collates a range of different articles, images and quotes found by the Buffer team online. Seeing it is correlated with the interests of their team, you will generally find marketing topics, productivity tips and some lifestyle news. That being said it is a great way to find content that you may not have come across if you simply stuck to your Feedly stream. The ‘Suggestions’ tab is located alongside the Buffer ‘Feeds’ panel in your dashboard. 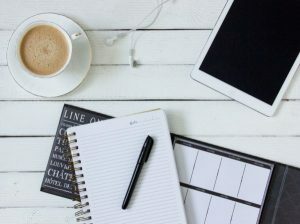 Note: Daily by Buffer is an awesome content sharing tool, but remember what I said about my post ‘Your Ultimate Blog Checklist’. If you want to stand out from the crowd I would highly recommend clicking on the link, reading the article and editing your tagline! Don’t go swipe crazy. 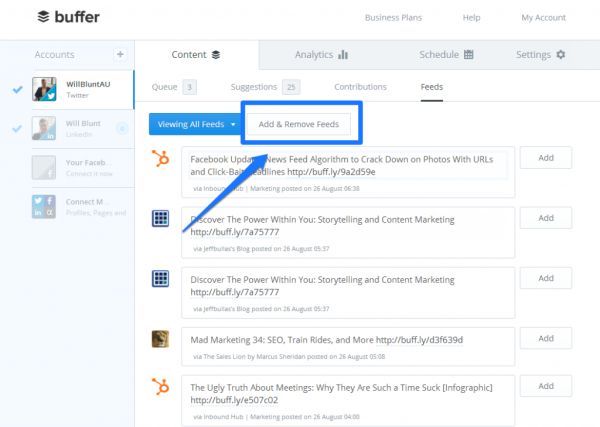 Buffer is trying to make sharing content easier, as a result they are helping us all discover content too. Finding great content with Swayy is fun, easy and extremely rewarding. All you need to do is sync your social accounts to the Swayy dashboard and it just about does the rest of the work for you. 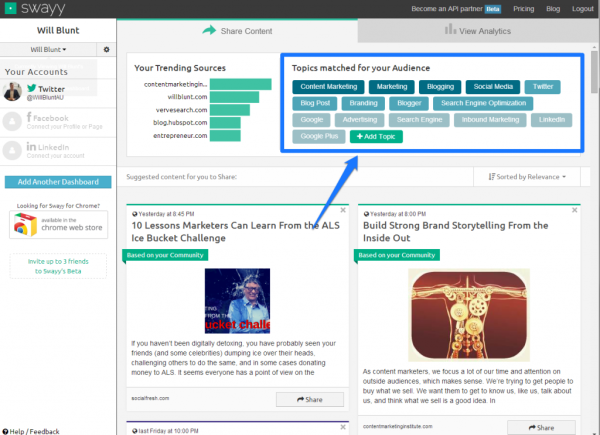 You will be automatically matched to topics that align with your audience. These are in the top right corner of the dashboard below. What I found was the algorithm had picked up some great topics for me based on my audience, but I wanted to share content about other stuff too. The ‘+Add Topic’ button is easy to use, and will help you build out your customized content stream in a way that suits your style. Once you have set-up your Swayy dashboard, you will then have a regularly updated stream of content tailored to your audience and ready to share. 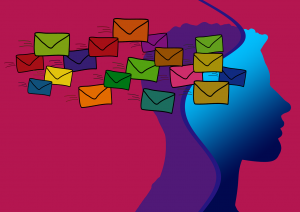 On top of this awesome dashboard, Swayy will deliver its best picks in your e-mail every day. 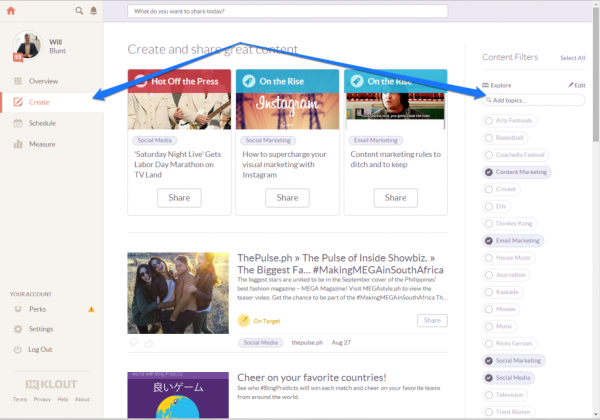 Swayy’s platform simplifies the content discovery process. ContentGems makes it easier to find content that is worth sharing by collating articles, blogs and news sources from everywhere on the internet. 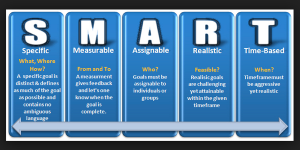 This content is then segmented based on the topics you choose. Sign up for a free account with ContentGems, pick your topics of interest and you will receive a personalized e-mail every day packed full of killer content. For each topic you choose you will get 20 suggested links in one big easy to read e-mail. For example, one of my topics is ‘Content Marketing’ and a screenshot of my daily e-mail is shown below. You will see the topic, ‘Content Marketing’, is clearly outlined at the start of the e-mail. This structure is kept consistent throughout the rest of the e-mail with my other topics of choice. One great feature the ContentGems e-mail has that is different to Swayy is the ability to automatically share the articles from your e-mail. Share them via ContentGems and Buffer, or save them using Instapaper or Pocket. 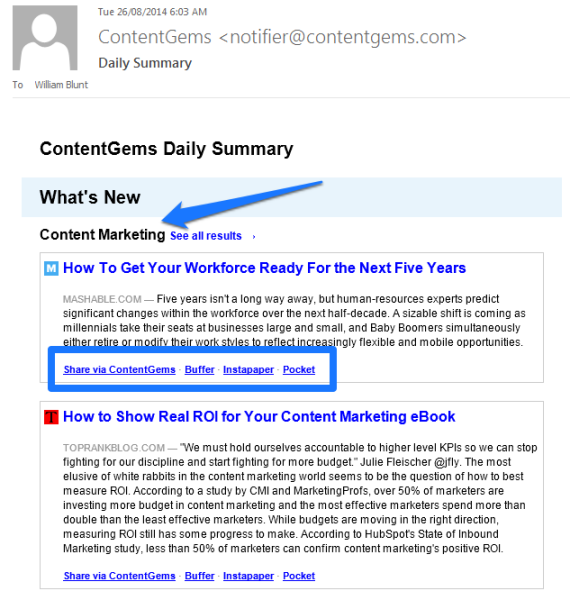 ContentGems sends you an e-mail every morning with up to 60 easy-to-share pieces of content 100% tailored to the topics you chose. What more could you ask for?!? Much like Buffer, Hootsuite is all about sharing consistent content to your social networks. In an endeavour to make that easier for you, they regularly innovate. 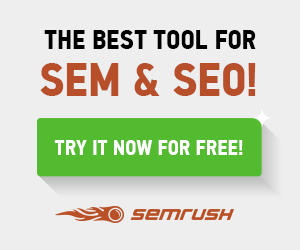 Here are a two innovations that will help you find better content online. For a little while it felt like Buffer was slowly taking over the social media scheduling game with some radical content marketing and amazing community management. In recent times though, we are starting to see Hootsuite bite back. I had the pleasure of connecting with David Kyle, Community Coordinator at Hootsuite APAC not too long ago. It turns out that Hootsuite are making a strategic move into the Asia Pacific Region and David was reaching out to users. The learning mentality and service orientation that has come across in our interactions so far has given me a new found appreciation for Hootsuite, but that’s another story. 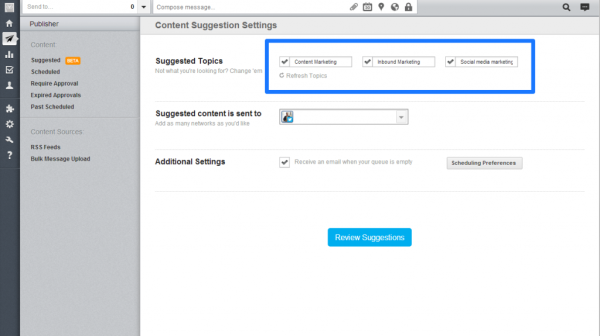 David encouraged me to use Hootsuite Suggestions whilst it is in BETA, so they could gather feedback. It is similar to the Buffer Suggestions concept, but there are a couple of jewels that make it unique. For example you can generate suggestions based on specific topics, more like Swayy or ContentGems, with the added benefit of easily scheduling those using Hootsuite. If you are wondering how to access this innovation, click on the ‘Publisher’ button on the right hand menu of your Hootsuite dashboard and then click on ‘Suggested’. Once you are in the suggestions area, you can change your topic preferences by clicking on the ‘Settings’ tab in the top right corner. On the settings screen you can easily modify your chosen topics and tailor your suggestions accordingly. Hootlet is an app you can install on your Firefox and Chrome browsers allowing you to easily share content on any website via your Hootsuite account. But what does this have to do with finding new content? One great feature of the Hootlet app is the Twitter suggestions when you search anything in Google. 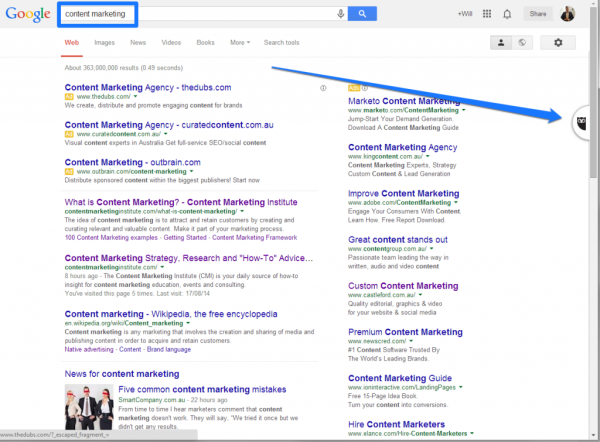 See below my search for ‘Content Marketing’ in Google. Click on the little owl you can see on the right hand side of the browser to engage a slider menu. As you can see the Hootlet app has generated a customized Twitter stream based on my Google search. Now you can schedule, reply or re-tweet a bunch of interesting content with a simple click before you get back to what you were doing. Hootsuite is definitely coming to the party when it comes to innovation, customer service and making content discovery easier for you. BuzzSumo is a search engine, just like Google, but it ranks content based on how many times it has been shared socially. Social shares are a great litmus test for what’s working, and what isn’t when it comes to content. 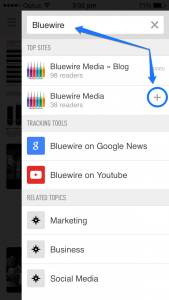 You can filter your results by content type, date of publish and social network. 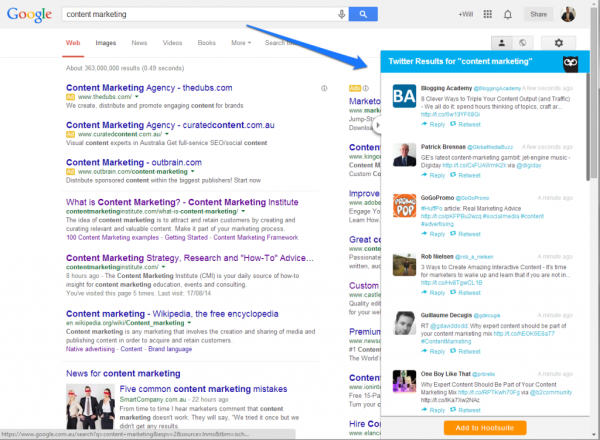 The search results will open up in a new screen automatically ranked based on social shares. Use the filters on the left hand side of the screen to narrow down your search and find the content that will be most valuable to your network. 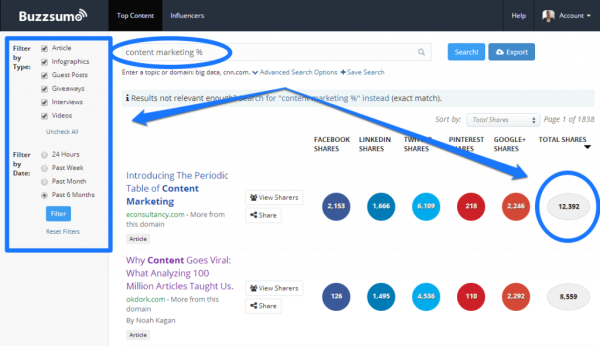 BuzzSumo is amazing for finding influencers, researching topics or testing blog ideas. Turns out it’s also incredible at finding interesting content you can share with your followers. Whilst Klout is best known for its social ranking system for a user’s influence online, it is also a fantastic hub for discovering content your followers will love. You first need to link your social networks to Klout. Then your dashboard will automatically populate with topics that resonate with your audience and the content that supports those topics. In the above screenshot, you will see the suggestions Klout has given me based on ‘Content Marketing’, a topic that automatically generated based on my social interactions. Notice at the bottom of the screen the ‘Hidden Gems’. 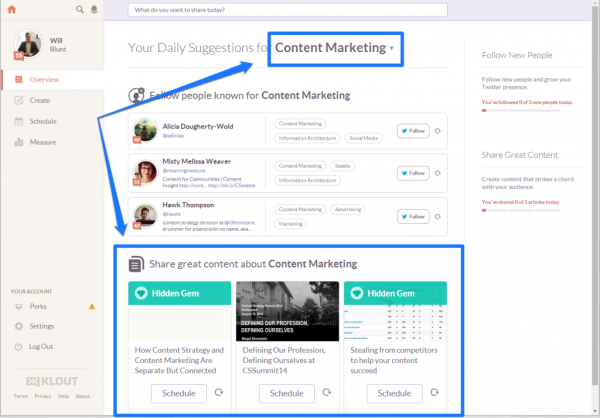 If you hover over the suggested content Klout will show you the likelihood that your network has already seen it. Something along the lines of “Only a 9% chance your audience has seen this link”. This is perfect if you are trying to find unique content to share. If you want to tap into topics that haven’t been suggested, use the ‘Create’ tab to start defining your own journey. In this tab you will be able to add new topics on the right hand side and create a customised stream of great content you can share with your network. Klout also makes sharing easy with a scheduling tool that pops up in your browser. If it’s unique content you are looking to discover, Klout might be your perfect match! Standing out in an over-crowded social universe is hard. But one way you can differentiate yourself is to find great content and share it regularly. The tools and tactics I have given you in this post will help you find better content in a manner that gives back your most valuable asset; discretionary time. If you’re not already, make the most of Feedly, Buffer, Swayy, ContentGems, Hootsuite, BuzzSumo and Klout! 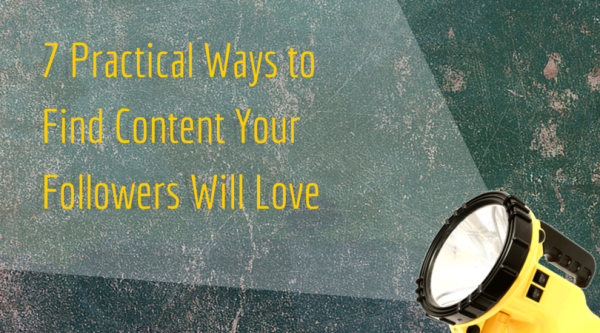 What other tactics do you use to discover content your audience loves? Do You Make These 3 Small Business Mistakes?